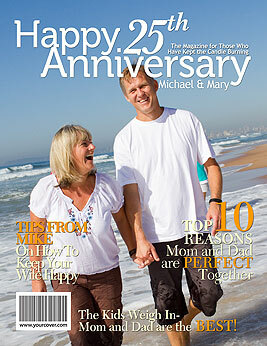 A personalized 25th anniversary magazine cover is a unique gift for celebrating a silver wedding anniversary. Magazine cover features the couple's photo and custom headlines about their 25 years together. Sure to be a 25th anniversary gift that will be cherished for years to come. The silver wedding anniversary, #25, is one that should be celebrated with class – and what’s more glamorous than a star-turn on a personalized 25th anniversary magazine cover. To make this unique personalized 25th anniversary gift, upload the couple’s original wedding photo or a more recent photo and then personalize the headlines to be all about their life together. Don’t forget to include happy memories and family members’ names. A wonderful memento to commemorate a milestone 25th anniversary, a YourCover personalized magazine cover is a unique 25th anniversary gift that will be cherished for many years to come! Make a Fake Magazine Cover using the YourCover magazine cover generator.